Closing this year with a big bang, on the nails. 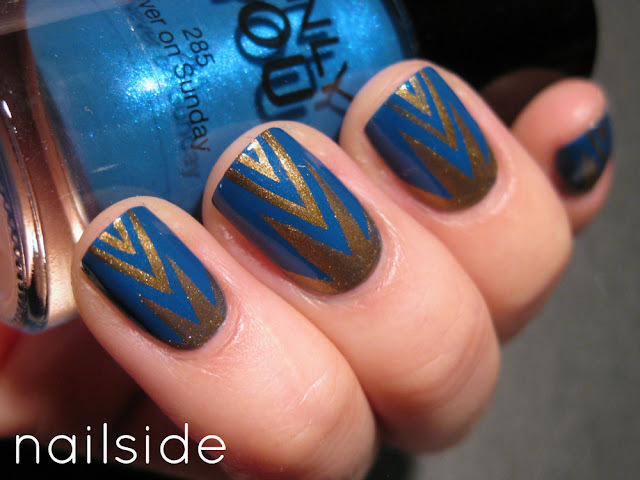 :-) Like my last post this mani features elements from Art Deco, a style introduced to me by my father. It took me a while to like it, as I was so in love with and used to the curvy and organic lines of its predecessor Art Nouveau, but now I can't get enough of both. ♥ Deco has these slick and stylized shapes, making it look so grand! It just keeps wowing me everytime. For the nail art I used the explosion design and a gold striper to freehand the little chevrons. All this on top of two coats of the blue Never On Sunday from Only You (house brand of Ici Paris XL). Heading off to family to celebrate New Year's Eve now. I wish you all a happy and healthy new year! Really great color combo :) and great design! Wow, way to end the year on a high note! I love this so much (I LOVE art deco though! ), seriously, AMAZING!! The lines look like you used tape! So perfect! these are absolutely amazing, i love them SO MUCH. the pattern is so perfect and the color combo is beautiful! Your lines are perfect! I love the blue and gold combo. I love art deco!!! Your last two designs are awesome. I can't wait to try them for myself, although I am really bad with straight lines, especially when there are several. But oh yeah, loving the art deco look! Hapy New Year to you, your and all your followers :) - may it be a grand one :D ! Super pretty, the metallic aspect of the gold really makes it stand out. Love. Lovely tape mani, very precise! Hi Laura, it's both. ;-) I used tape for the explosion/sunburst and freehanded the chevrons at the tips. perfect as always! happy new year! Amazing nail art! Happy New Year! Dit ontwerp vind ik echt heel mooi! Ik ben al lang fan van jouw blog, en ik vind het echt rustgevend om naar jouw absoluut perfecte nagels te kijken. Ik ben zelf ook verslaafd aan nagellak, en sinds gisteren heb ik zelf ook een blog gemaakt. Ik hoop dat het er ooit zo mooi gaat uitzien als de jouwe! Dankjewel voor je lieve reactie. En gefeliciteerd met je eigen blog! Ik weet nog dat ik het echt super spannend vond toen ik mijn eerste bericht postte, zal voor jou ook zo zijn denk ik. ;-) Veel succes en vooral veel plezier ermee! I actually love everything you do I just realized ♥. Wow!!! this mani is so pretty. Love the color combos and the design. Extraordinary with class. Love it! Great job on this one. I've always loved how crisp your designs are. Looking forward to more of your awesome nailart in the new year! A happy new year, Jane!